Reader David Reed is looking for help in locating specific Michigan death certificates from the late 1800s. It seems that David has found that the certificates he needs were recorded and so are now organized by the wards in Wayne County, Michigan, and without a good overview of the ward boundaries, David is having trouble locating the specific certificates he needs, from 1880 to 1910. So, since Wayne County had both incorporated cities (like the City of Detroit) and unincorporated areas outside of city limits, and it had smaller communities and townships, it isn’t clear to The Legal Genealogist that all of Wayne County would have been under the ward system during this time period. So the big area that was under the ward system was Detroit. The First Ward to embrace that part of the said city situate west of the centre line of Shelby, and south of the centre of Michigan avenue. The Second Ward, all south of the centres of Monroe and Michigan avenues, and between the centres of Shelby and Randolph streets. The Third Ward, all south of the centre of Croghan street, ana between the centre lines of Randolph and St. Antoine streets. The Fourth Ward, all east of the centre line of St. Antoine street, and south of the Gratoit road. The Fifth Ward, all north of the centre of Michigan avenue, and west of the centres of Woodward avenue and the Saginaw turnpike. 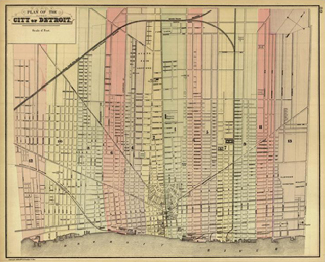 The first ward shall consist of all that part of the said city lying between Woodward avenue and Beaubien street, and the line of said street extended on the so,uth to the Detroit river and the north to the city limits. The second ward shall consist of all that part of said city bounded on the east by Woodward avenue and on the west by First street from the Detroit river to Grand River avenue, up Grand River avenue to Second street, and along Second street and the line [of] Second street extended to the city limits. The third ward shall consist of all that part of said city lying between Beaubien street and Hastings street and the line of said streets extended on the south to the Detroit river, and on the north to the city limits. The fourth ward shall consist of all that part of said city lying between the west boundary line of the second ward above described and Crawford street from the city limits to Grand River avenue, down Grand River avenue to Fifth street, and down Fifth street and the line of said street extended to the Detroit river, and the lines of said streets extended on the south to the Detroit river and on the north to the city limits. The fifth ward shall consist of all that part of said city lying between Hastings street and “Russell street and the lines of said streets extended on the south to the Detroit river, and on the north to the city limits. The sixth ward shall consist of all that part of said city sixth, lying between the west boundary line of the fourth ward above described, and Trumbull avenue and the line of said avenue extended to the city limits and the Detroit river. The seventh ward shall consist of all that part of said Sevena, city lying between Russell street and Deqnindre street, and the lines of said streets extended on the south to the Detroit river and on the north to the city limits. The eighth ward shall consist of all that part of said Eighth, city lying between the east line of the Godfrey farm (Thirteenth and a half street), and Trnmbull avenue and the line of said avenue extended to the city limits and the Detroit river. The ninth ward shall consist of all that part of said city ninth. lying between Dequindre street and Ghene street, and the line of said street extended to the city limits. The tenth ward shall consist of all that part of said city Tenth, lying between the west line of the Loranger farm (Twentieth street), and the east line of the Godfrey farm (Thirteenth and a half street). The eleventh ward shall consist of all that part of said Eleventh, city lying between Chene street and McDougall avenue, extended on the south to the river and on the north to the city limits. That should be enough to … um … ward off trouble, no? Hi Judy – David can also access free copies of Michigan death certificates (actual scanned images) from 1897-1940 at http://www.seekingmichigan.org (click “advanced search” button in upper right corner, put tick marks in boxes for death certs and fill in fields). The MI Dept of Health & Human Services has indexed death records (no images) from 1867-1897 at http://www.mdch.state.mi.us/pha/osr/gendisx/search2.htm. Hope that’s helpful for anyone seeking Michigan death info for those years! Early Michigan vital records are digitized and mostly free. Most of the online indexes do not indicate ward for Detroit so can’t search by ward but often it is on the certificate/record itself. They primarily start at 1867, though there are some county marriages that were recorded earlier. Ancestry also has several databases for various Michigan vital records including divorce. (Ancestry has soundex searching.) Check your local library to see if it has an Ancestry Library Edition subscription (most are in-library use only) if you do not have a home subscription. It’s good to have Michigander ancestors these days! Of course, there are those ancestors that failed to file a record or fill out all the information requested … they resided everywhere. Oh, so helpful. You Gene’s are the best!